A hydrated mom is a happy mom. Did you know that once you hit the point of feeling thirsty you’re already dehydrated? Tiredness, dry skin, headaches, dull sunken eyes, dizziness and constipation can all be signs telling you it’s time to re-hydrate. Yet keeping your water level up while on the go can be tricky. A great water bottle you love makes it easier. Now you can win one in our Mother's Day Giveaway! Simply tell us your favourite water bottle colour and you could win a non-leaching, recyclable, reusable Lifefactory glass water bottle - one of our most popular bottles ever! Share it for a better chance to win it! Leave separate comments for each share and receive extra entries. 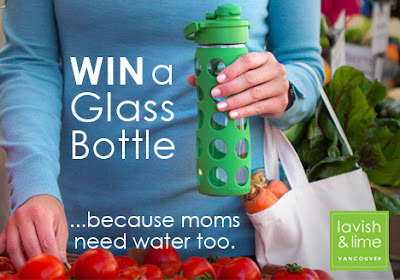 Water bottles make great gifts for all the moms in your world, including you! Choose from our selection of the top glass and stainless steel bottles on the market and use code LUVMOM through May 8th to receive 15% OFF for Mother’s Day! Stylish Lifefactory reusable glass water bottles are not only the right choice for anyone concerned about BPA leaking into their drinking water, but also for anyone who likes to see exactly what they're drinking. Unlike other bottle options, see-through glass allows for 100% thorough cleaning; what you see is what you ingest. Glass also preserves water's true taste and is fully recyclable. Plus a colourful plastic sleeve on these glass water bottles helps prevent breakage. Choose from a variety of colours, two sizes and two tops – the classic screw cap or the newer flip cap spout. The glass is made in Europe, the protective silicone sleeve in the USA. The winner will be chosen in a random draw. Deadline for entries is 11:59pm PST Saturday, May 11th, the giveaway closing date. The winner will be notified by email on Mother's Day, Sunday, May 12th and announced thereafter. Open to residents of Canada and the U.S. who are over the age of majority in their province, territory or state of residence. Prize must be accepted as awarded and may not be transferred or exchanged. They are not redeemable for cash and are non-refundable. I love the pink raspberry! Liked, Shared & commented on Facebook. several pins on Pintrest and reposted to facebook. Love that it is called ROYAL purple!!!! I lied on FB Ocean is my pick! I really like the ocean color! I love the midnight blue! Thank you for hydrating everyone in style, Annemary - annemarys2002@yahoo.ca! Love them all, definitely dig the royal purple and turquoise the best! Liked and shared on Facebook as well. I have red, raspberry, grey. I must have orange. So crazy about these. Great product life factory! My favorite is the flip cap purple hex bottle. Thanks for the chance to win! I LOVE the Raspberry one! Liked, shared, pinned and tweeted! I like the spring green! I like the Midnight blue! I liked and shared the Giveaway on FB! I repinned the contest on FB! I would like the turquoise bottle. I like all the colors but pink I guess is my favorite - very beautiful (and healthy) bottle. Orange is such a beautiful color, it reminds of coral reifs!! spring green is so spring like! "liked"a bunch of them. What a great prize! Purple and midnight blue are my favorites. Turquoise will be differently my pick! Clicked the 'like' button on all of your Lifefactory Bottles product pages! I Like the Giveaway on Facebook! Pink raspberry is my absolute favourite colour! My favourite colour is carbon hex! Oh, the royal purple of course! My favourite is the Glass Water Bottle - flip cap ocean 450ml. Spring green is so fresh and pretty! I like the midnight blue. I like the sky blue one! I love the midnight blue colour. either of the purples or raspberry! So hard to choose between the orange and lime green....ummm....lime green!!! LOVE the Ocean colour bottle!! I like the ocean colored one! I'd love the turquoise color one! I like the Spring Green water bottle. Thank You for the giveaway! !